Announcement Handmade Chalk Bags from ClimbAddict Designs. Our collection of rock climbers chalk bags are made with high quality fabrics, hand chosen for their colors, design and durability. Most designs are made in small batches, with limited availability of two and three pieces. Each piece is finished with hand stitching, insuring personal attention to detail and strength in the collar and loops. The owner of ClimbAddict Designs, Terrie Marcoe, has other shops on Etsy, and hopes you will stop in and browse. You can find ponytail holders made from vintage buttons at http://www.TalismanStudios.Etsy.com. They are a pretty way to keep that hair out away from the ever-hungry belay device! Beaded jewelry with a romantic style can be found at http://www.TalismanToo.Etsy.com. Remember though, jewelry is for rest days. When on the ropes, keep it simple, and safe! 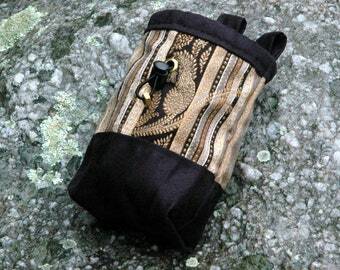 Handmade Chalk Bags from ClimbAddict Designs. Our collection of rock climbers chalk bags are made with high quality fabrics, hand chosen for their colors, design and durability. Most designs are made in small batches, with limited availability of two and three pieces. Each piece is finished with hand stitching, insuring personal attention to detail and strength in the collar and loops. 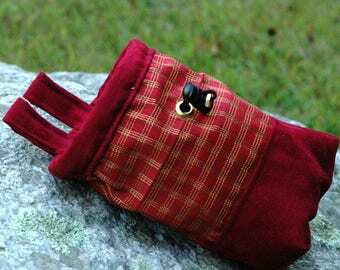 This chalk bag is well constructed, very stylish, and I love it. Bought another one for my lovely bride as well. Thanks for Taking a Rest Day and Visiting ClimbAddict Designs! 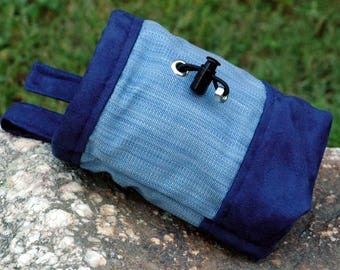 ClimbAddict chalkbags are made in very limited quantities. Most designs have only three pieces made with the materials. Each bag is started with machine sewing, and later completed by hand. Because the top collar has boning added as a stiffener, the best way to have a clean finish is to take it one stitch at a time. It takes between 30 minutes and an hour to do that last bit of hand sewing. No thoughtless zipping through on the machine, for these chalkbags! The person behind CimbAddict Designs is Happiegrrrl, and she(me) also does graphic designs for t-shirts, stickers and other stuff, and you can see that collection by clicking the "Shop Website" link on the right sidebar. Enjoy your visit. If you have any questions or comments, please send us a message by clicking the "Contact" button on the sidebar to your left. I will respond as quickly as possible, usually within twenty-four hours. Keep in mind that I live in a primitive setting - either an off-grid cabin(April through October) or on the road(November through March) and can have limited internet access at times. - Please contact us by email within five business days of receipt of goods. Refunds for purchase price will be provided upon return of goods. Sorry, we can not reimburse for return shipping costs. You can make your purchases with all major credit cards, or via PayPal. We ship ALL orders asap, usually by the next available business day. On occasion, another day is needed to do the hand sewing. We will always send a note once your item is en route! International Orders: We do ship internationally! Please note that the postal service charges a large fee in order to track/confirm delivery for packages sent outside the United States. The cost is between $12 and $18 USDollars, per package. Therefore, we ship regular delivery, which is much more cost efficient, but does not allow for tracking on our end. - In general, we do NOT use a tracking/confirmation service for our overseas shipments. - The US Postal Service says that most packages shipped internationally arrive 5-10 days after shipped. However, the reality is that often packages take longer, due to delays going through the Customs process. Every country has different practices. Please allow at least two full weeks before being concerned. - Several buyers and sellers have given accounts of items taking up to 4 months, and even longer, to arrive. Therefore, we believe it is reasonable to wait 30 days after shipment before beginning the process of considering replacement/refund or another option. It may take up to another 14 days before we confirm our decision and act. During that time we will be researching the Customs policies of the particular country, and other considerations. - We reserve the right to decline orders from customers with a history of claims of non-receipt of goods. In such cases, the order will be canceled before shipment and any payment made will be refunded. - Any Customs fees and/or taxes are the responsibility of the buyer. It is my hope that you will find your ClimbAddict chalk bag to be the best one you have ever had. If you have an questions or comments, send me a message!